(CNN) -- One half Indian, the other Pakistani, they are the most talked-about partnership in tennis. Dubbed "the Indo-Pakistan Express," Rohan Bopanna and Aisam-Ul-Haq Qureshi hope to end their breakthrough year with a showdown at the infamous Wagah border that divides their countries. Bopanna, an Indian Hindu, and Qureshi, a Pakistani Muslim also aged 30, reached their first major doubles final at the U.S. Open in September and climbed to eighth in the world rankings. Yet their work off the court has attracted just as much attention as they try to soften the often-fractious relationship between their two nations since partition in 1947. The pair have been honored with a string of awards for their humanitarian work in the past 12 months, and are determined to start picking up tournament titles in 2011. Can champion duo's reunion spark an Indian tennis boom? But a showpiece clash at the notorious border crossing that hosts a nightly pageant between India and Pakistan's border forces would be the perfect way to carry their "Stop War, Start Tennis" campaign into the new year. "We're thinking how to get to a wider audience and spread the message of peace through our partnership and thought," Qureshi told CNN's Open Court. "How about playing a match at the Wagah border, with Rohan playing on the Pakistani side and me on the Indian side for a gesture of friendship? "At the U.S. Open the ambassadors to the United Nations for Pakistan and India both came to watch the semifinals and finals. That was a huge deal because normally you don't see two diplomats cheering for one cause -- it was a really positive sign. I just hope in the near future we can have that match at the border, that would be great." The village of Wagah, near the Indian city of Amritsar and the Pakistani city of Lahore, is the only road border crossing between the two countries, and the daily ceremony -- which includes a lot of strutting, stamping and saluting -- regularly attracts a crowd of thousands. A match there could be a watershed moment for a pairing that first emerged in 2003 but did not make a major impact until this season. Their burgeoning partnership on court is allied to a deep-rooted desire to strengthen links between two countries which have a long and deep distrust of each other. 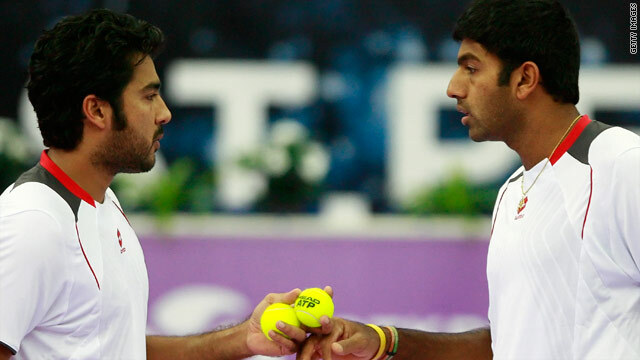 "We're both brand ambassadors for an organization called Peace and Sport," Bopanna said. "Right now we're trying to see if we can help tennis in both our countries, promote it and keep the sport growing as much as we can." As well as receiving the Arthur Ashe Humanitarian of the Year award at the recent ATP World Tour Finals in London, they were also given the Peace and Sport Award for 2010 at a glittering ceremony in Monaco. I've always told him I think he's the most popular Indian guy in Pakistan this year! The citation read: "Their commitment to promoting peace between the two countries and their conviction that peace was possible was shown amply during the year." Joel Bouzou, president of the Peace and Sport Foundation, added of the proposed Wagah match: "The sport is ready for peace. Will the two governments rise to the occasion?" Their partnership may have attracted plenty of headlines but for Qureshi, teaming up with his Indian counterpart made perfect sense. "I've been playing with Indian players ever since I started playing tennis," he said. "Unfortunately there are not that many Pakistanis on the tour, and playing with an Indian was actually the most natural thing that came to me -- having the same language, most of the time having the same dinner, Indian or Pakistani foods in the evening. "The first time I ever traveled to India when I was 16, I was one of the top [Pakistani] juniors and he was one of the top juniors in India and that's how I got to know him. "Knowing his attacking style of play, I always knew if we played together we'd be able to make a really good impact. I think results clearly show in that way I was right, though normally he tells me that I am always wrong!" As well as their run to the final of the U.S. Open, where they were beaten by the Bryan brothers from America, they also enjoyed success at Wimbledon which made them household names back home. "This year we made the quarterfinal at Wimbledon and that was very, very big in Pakistan," Qureshi said. "I've always told him I think he's the most popular Indian guy in Pakistan this year! "I can thank him enough for that because obviously without him I wouldn't have been able to achieve all those goals, and with him being my best friend on the tour it makes it the icing on the cake. It's been a great journey so far."